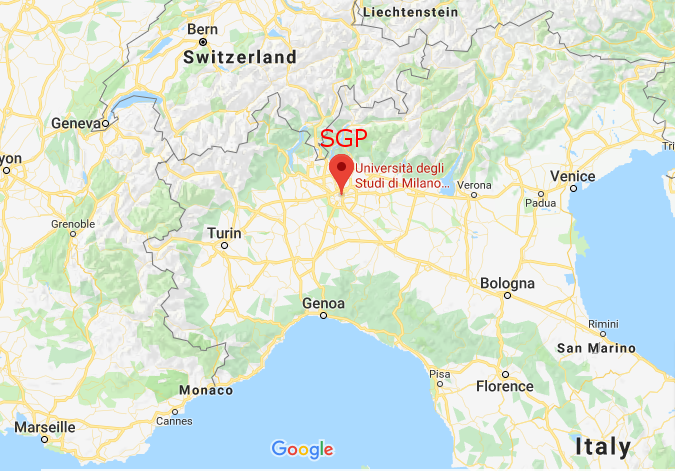 The Sixteenth Eurographics Symposium on Geometry Processing (SGP 2019) will be held at the Aula Magna of the Department of Computer Science "Giovanni degli Antoni" of the Università degli Studi di Milano, in Italy. Linate [LIN] (website): in the very city of Milan, 10 minute by taxi from the conference venue (<6 Km). Malpensa [MAL] (website): some 50 Km from the venue, it is connected by frequent trains and buses to the Central Station (<40 min). From there, the venue can be reached in 15 min by metro or cab. Orio al Serio [BGY] (website): actually closer the nearby medieval city Bergamo, is connected by a shuttle service to Milan Central Station (45 min). From there, the venue can be reached in 15 min by metro or cab. Note: there is no Uber in Italy. Metro: Once in Milan, the venue can be easily reached by public transportation. Milan is served by an efficient subway. The venue is 10 min walking from the Piola or Lambrate Metro stations, both on the Green Metro Line (M2). They are 3 stops (4 min) away from the Central Railway metro station (no changes). Bike Sharing: biking is a good way to move within Milan. Consider having one bike-sharing applications installed on your mobile, such Mobike, and using it during your stay.